Brendan Courtney enters This Crowded House for the last time, Tracey Ullman gets The South Bank Show treatment, while US dramas Ray Donovan and 9-1-1 continue . . . This hugely enjoyable drama about an LA fixer has more or less run its course – but last week's season six opener offered hope for fans. 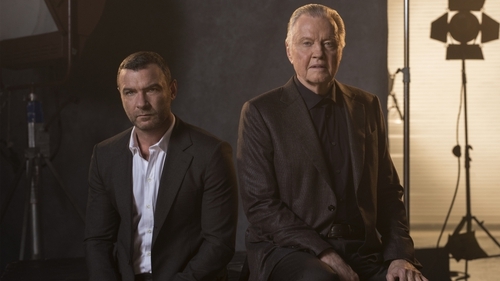 Liev Schreiber's re-shaped character (now wearing a Yankees cap, casual clothes and a bit of a belly) has been reborn in New York, yet no matter how much he wants it to go away, Ray isn’t done cleaning up the fallout from his jump. People are asking questions, and there’s a witness willing to provide some uncomfortable answers. Meanwhile, across the country, Mickey’s heart attack forces the family to wrestle with what could be the roguish patriarch's final days. This film captures the work of renowned Belfast-based artist Noel Murphy’s six-month journey as he paints all 53 women members of the Oireachtas in one single portrait. The completed work was unveiled in March on International Women’s Day, marking both the centenary of the 1918 election of Countess Constance Markievicz, the first woman in the world to hold a cabinet position, and the record number of female TDs in the 32nd Dáil following the introduction of the gender quota in 2016. Kevin McCloud embarks on a journey to examine some of the most cutting-edge contemporary UK homes, all of them in the running for the 2018 Royal Institute of British Architects House of the Year. In this first episode, Kevin and his co-presenters visit five extraordinary homes that their owners dare to be different. In this new run, Melvyn Bragg sits down with five inspiring women, uncovering the secrets to the successes, before taking a closer look at why the arts, as a whole, are so important to people. The first episode focuses on Tracey Ullman, the British comedic actress who first wowed American TV audiences in 1987 with her award-winning The Tracey Ullman Show, which, among many other highlights, introduced the world to The Simpsons. Walter Presents continues with what promises to be an unsettling French crime drama, the sequel to Vanished by the Lake. Three years after Lise and Clovis met while investigating the disappearance of a teenager, they are married with a nine-month-old son and their work has taken them to the shores of Lake Annecy. The corpses of two women are found, one right after the other. Lise and Clovis have no doubt that it must be the work of a serial killer. Here's a new factual documentary series presented by Eoghan McDermott that gives an insight to today’s Ireland. In tonight's opening programme, McDermott goes on a journey based on personal experience to explore the increasingly prevalent and disturbing culture of random acts of violence in Ireland and the enduring effects they have on victims. In the last episode Brendan Courtney meets two more young adults - one in Wicklow and one in Dublin - who are living at home with their parents and looking to fly the nest. Unusually for this show, he also meets a mother who also needs a bit of help. Emily needs help as her rental property is being taken back by the landlord. As regular watchers of this addictive prime time show from Ryan Murphy and co will know, the LA emergency services are continuing to deal with the after-effects of the devastating earthquake that occurred during last week's episode. As Athena tries to keep the peace while Bobby and his team continue to rescue victims from the collapsing hotel, Maddie’s first day on the job involves helping a pregnant couple deliver their baby.